Description Be SelFish, yes be the most selFish fish in the pond. SelFish is a fun puzzle skill game. 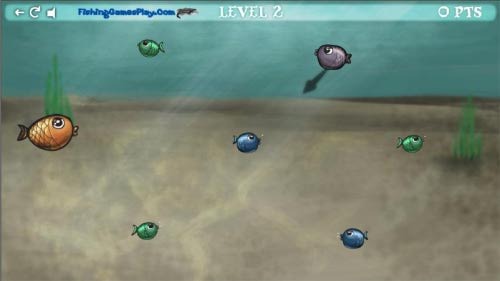 You play as a small gray fish. Go through many levels, eating smaller fish to become the biggest fish around. If you are too small and decide to eat a bigger fish, you will be the one to get eaten. This game starts out easy, but becomes much harder as you get to the higher levels. Hope you enjoy the addicting challenging gameplay and art style. This game is brought to you by FishingGamesPlay.com and created by Milica Andjelkovic and Stefan Nikolic. Move your mouse to aim and click to swim around. Eat smaller fish in order to grow and eat bigger fish.